He was a well-respected shortstop during his 23-year MLB career. As a result, Omar Vizquel cards and autographed memorabilia have the potential of increasing in value should he eventually make it into the Hall of Fame. A gifted fielder, he won 11 Gold Gloves. 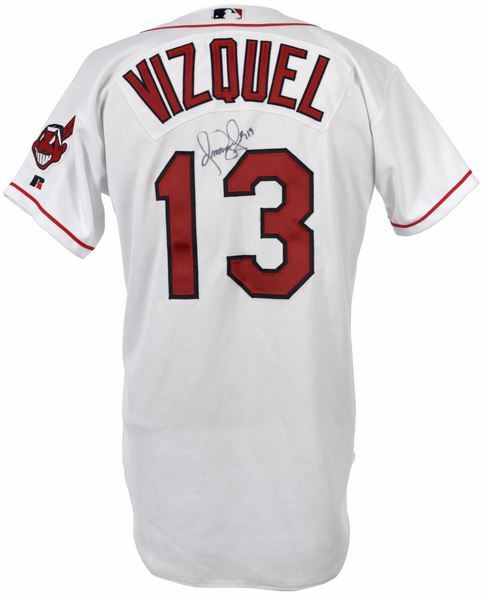 Vizquel was a solid contact hitter and has 2,877 career hits to go with a .272 lifetime batting average. For many year, shortstops weren't considered to be a run producers. That evolved with the likes of Cal Ripken Jr, Nomar Garciaparra and Derek Jeter. Vizquel played during this transitional period and is a throwback to the position's original perception of competent fielding, with good base running skills. As a result, he never attained the same fame as other more offensively minded players of his era. 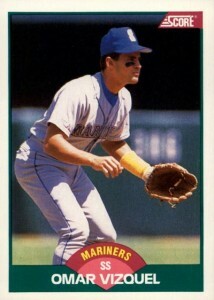 Omar Vizquel has a total of five rookie cards from 1989 sets. All but one are from update sets and all are very affordable. In high-grade condition, they receive only a slight premium. 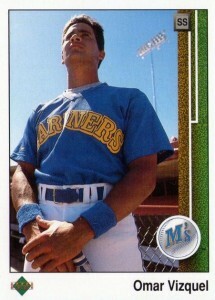 In addition, Omar Vizquel has several minor league cards dating back as far as 1986. Some of these are quite rare. He also has several first-year cards that are inserts or oddball cards and aren't generally considered rookie cards. These are still popular with player collectors. Vizquel's first certified autograph card was issued in 1996 Leaf Signature Series. There are three versions of the card, each with varying print runs. The base autograph card has 3,500 copies. The Silver parallel has a print run of 1,000 and the Gold version 500. None of the cards are serial numbered. 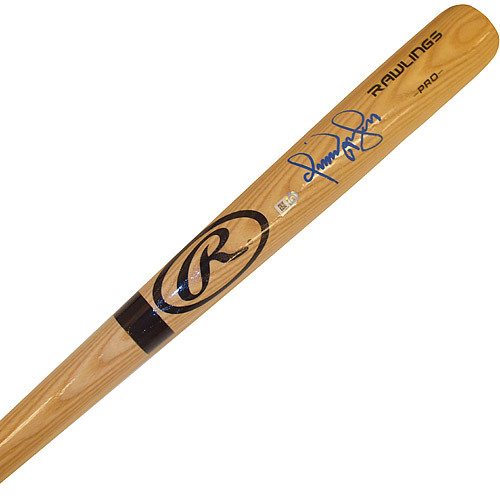 Over the years, Omar Vizquel autographs popped up in other products but not in massive quantities. He's a fairly tough signature to find today on cards. Omar Vizquel's first game-used memorabilia cards were released by Pacific and Upper Deck in 2001. One of the most popular is his SP Game Bat Milestone Piece of Action International Gold card. It is serial numbered to just 35 copies. His autographed memorabilia remains incredibly popular with fans and collectors of the Cleveland Indians. He spent ten-years with the team, the most of any of the six teams he played for during his career. He has always been a personable in-person signer. Vizquel is one of the rookies included in this 56-card boxed set. The card is very inexpensive. It is prone to showing edge wear along the black border area of the card. 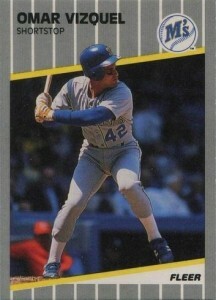 This card is part of the end-of-season set that was released in November of 1989. It contains several rookies and traded players. The gray color scheme of the design is one of the less appealing of the era. Vizquel is part of the last 30 cards on the set's checklist, all of which are rookies. It features one of the brighter photographs of Vizquel. 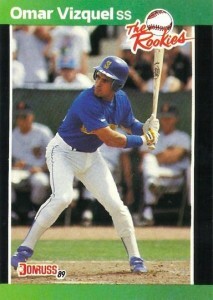 This is one of Vizquel's more popular rookie cards. It is part of Topps annual, year-end set. The cards were printed on a slightly whiter card stock than the cards in the regular season release. A higher-end Tiffany version also exists with a heavy-gloss finish. 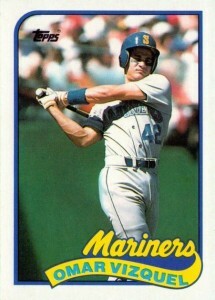 Vizquel's rookie card is part of Upper Deck's inaugural baseball card set. It is his only rookie card issued in a regular season set. 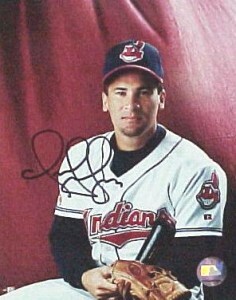 The card features the most unique photograph of Vizquel in comparison to his other cards. This set is one of the most revered and iconic sets of the modern age. It was revolutionary for its counterfeit measures and use of a second player photograph on the back of the card. 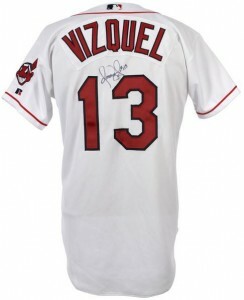 Below you will find an example of what Omar Vizquel's authentic signature looks like. This can be used as a first point of reference for determining the legitimacy of autograph memorabilia, but is not a substitute for having your items authenticated by a well-respected professional autograph authentication company. Some of the trusted sources within the sports memorabilia market include the following companies: PSA, JSA, Steiner, Mounted Memories and Tristar. Click on any of the images below to view full size photos. It is a nice looking signature written on an even horizontal plane. It is hard to discern individual letters. The defining characters are the three over-sized letters, with the large, teardrop-shaped loops. Omar Vizquel 11x GG insc. 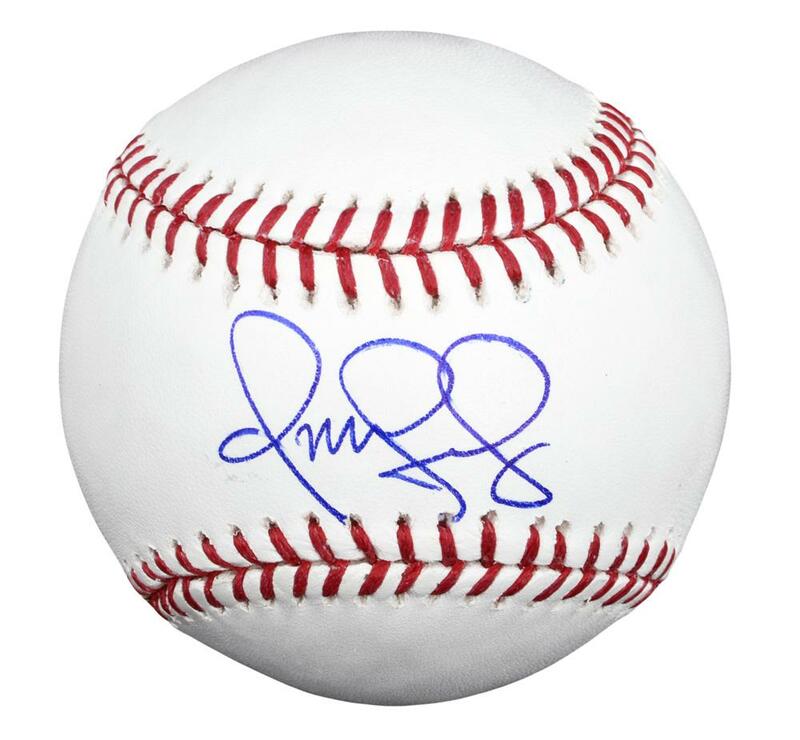 Signed Autographed OML Baseball TRISTAR HIDDEN TREAS.